The newest place at Epcot for a bite to eat has quickly become my favorite. 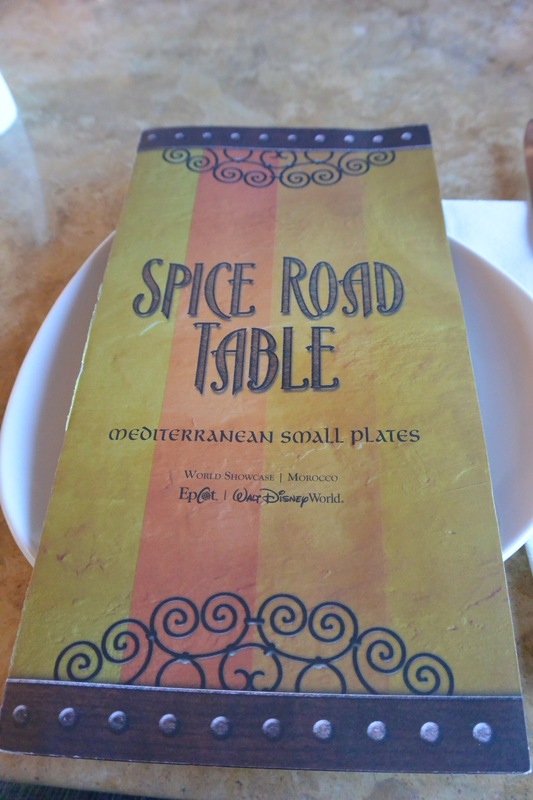 Walt Disney World welcomed Spice Road Table to the already stellar dining options available in the World Showcase Pavilion. 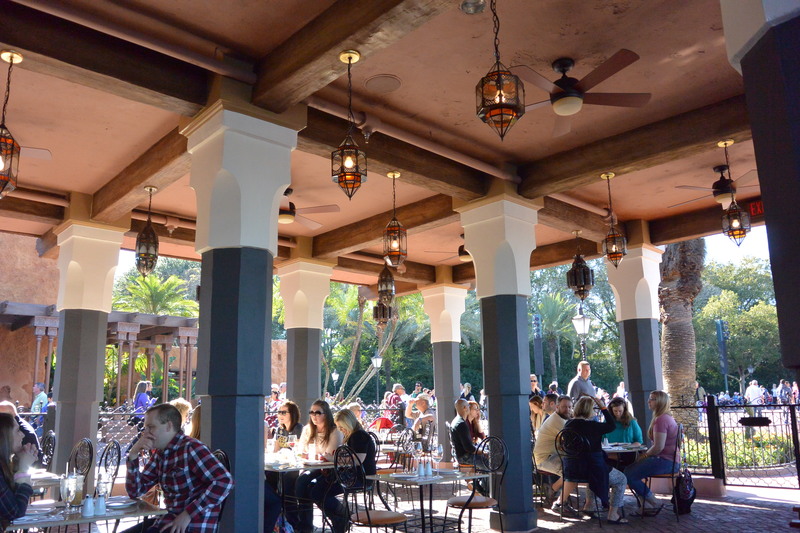 Spice Road Table sits on the shore of the Morocco pavilion, and features small plates with Mediterannean flavors. I’m not ashamed to say I’ve eaten at the new tapas restaurant several times since its opening in January. Here are five dishes you have got to try! 1.) Hummus and Imported Olives. On our first visit to Spice Road Table, we had a bit of a service issue. We happened to be seated when our would-be server went on break so we sat for 15 minutes without being helped. To make up for our wait, the serving team gifted us with this amazing dish. Within minutes, we had eaten all of it. Maisy was a huge fan as well! We loved it so much we’ve gotten it every time since then! The hummus plate features two kinds of hummus, a standard plain hummus and a tomato hummus. Both are excellent on the warm, Za’arar flat bread. 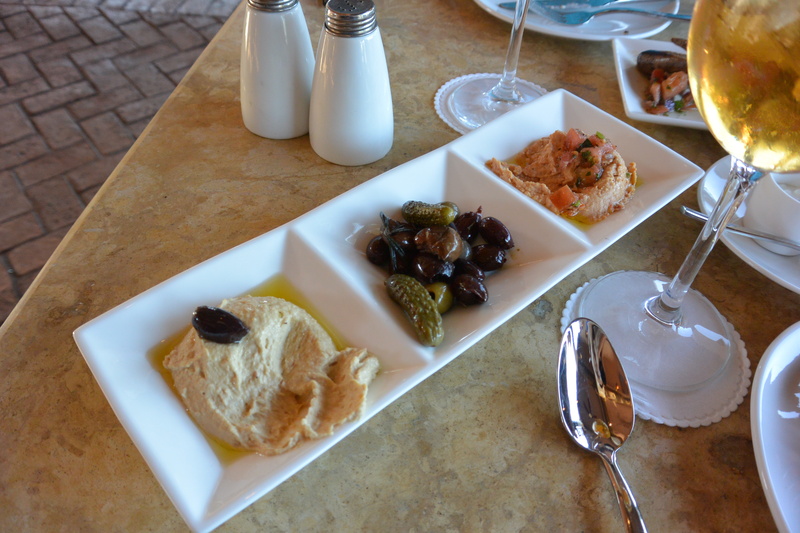 The olives are perfectly briney and I love dipping them in the rich hummus. It’s a large size but doesn’t come with enough bread for two or three people. Extra bread can be (and should be) ordered on the side. Served with a spicy curry ketchup, this chicken roll is a generous size for one person and a perfect serving for two. I loved the wrap on this, it was perfectly crunchy. The chicken was seasoned with a kick but it was not spicy. It balanced well with the curry ketchup. This is one of Justin’s favorites! 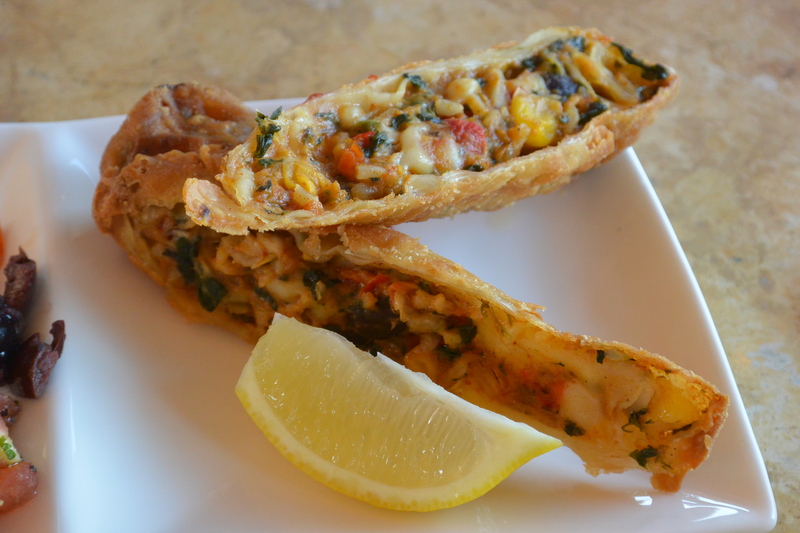 This is a dish for an adventurous soul. 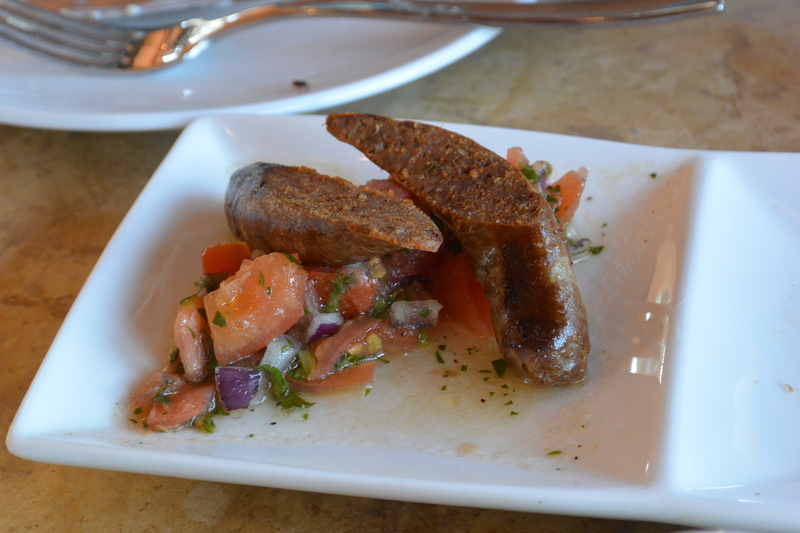 North African lamb sausage—a tough but flavorful sausage—served over essentially a Mediterranean pica de gilo: a red onion, tomato and cilantro salad. I could have eaten the salad forever. So very good and fresh! This plate is a very small portion. With only one slider on the plate, it doesn’t make for easy sharing. But my god it’s the absolute best thing on the menu. This slider features a patty made of seasoned, ground lamb on a Brioche bun, topped with a dill and mint Tzatzikiki sauce. My usual complaint about lamb is that it can be too heavy. This slider is so light and refreshing that I just can’t get enough of it. I would consider myself a connoisseur of Calamari. When I was pregnant with Maisy, I had a craving for the stuff all the time. So when I see it on a menu, I’m always dying to try it. And I’m always picky about how it tastes! 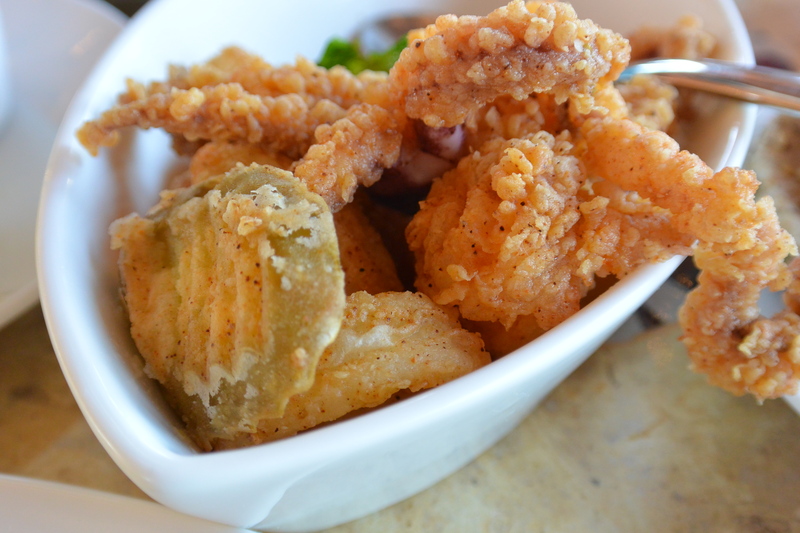 The calamari is always fresh, never chewy or greasy, and breaded in a flavorful mix with just a bite of pepper. What truly sets this calamari above the rest is the sauces it is served with: the spicy Harissa sauce is my absolute favorite. I was dipping olives, pita and hummus, the lamb slider, everything in there! It gave everything a warm, spicy flavor and paired perfectly with whatever it was on. 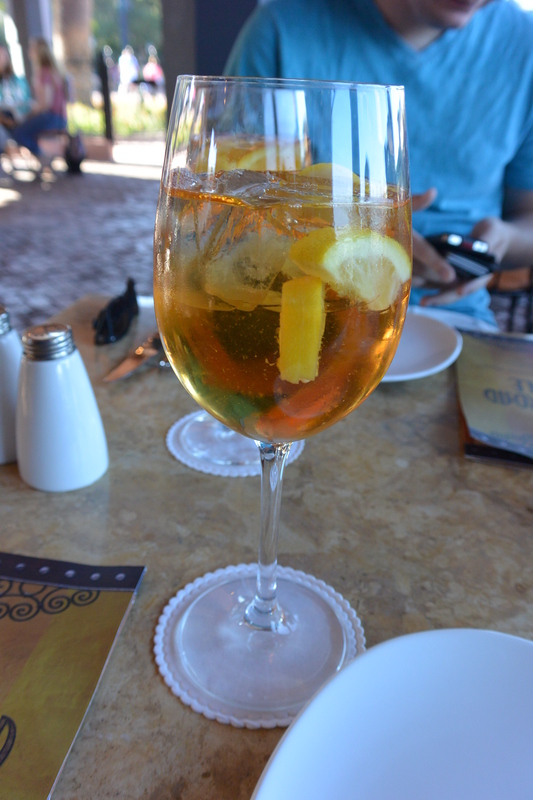 When you visit Spice Road Table, don’t forget a glass of their Organic Sangria. Available in red, white, or sparkling, no Mediterranean feast is complete without it. 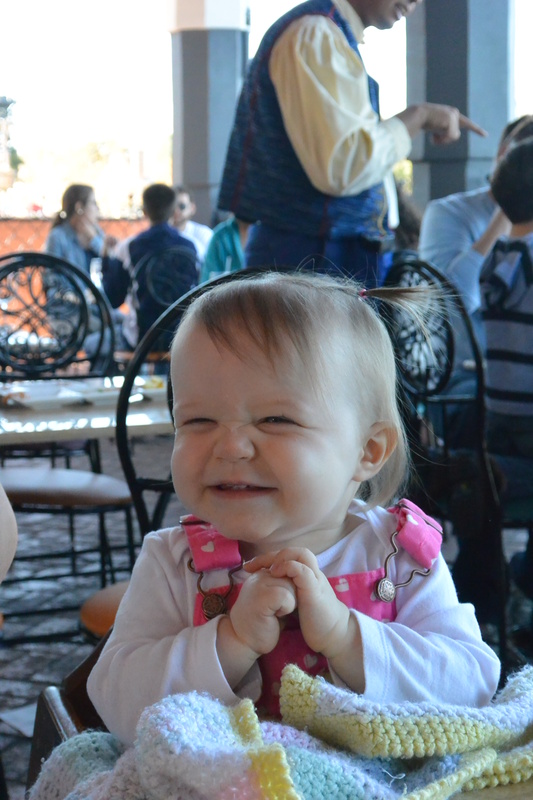 I hope you decide to stop at Spice Road Table on your next visit to Walt Disney World. Come back and tell me how it was!